Easy, fast pressure cooker chicken and rice is the perfect one pot meal for busy weeknights. Tender chicken, juicy mushrooms, and fragrant rice make the ultimate comfort food. Jacky loves to eat Chinese clay pot rice. The kind that’s cooked under an open fire with the flame so big that it wraps around the whole pot. Best if it’s cooked with a coal stove. We missed it so much that it was the first thing we ate in our last trip to Hong Kong. Ha! It’s the ultimate one pot meal that’s so comforting to eat. There are so many variations of one pot rice we want to try!! 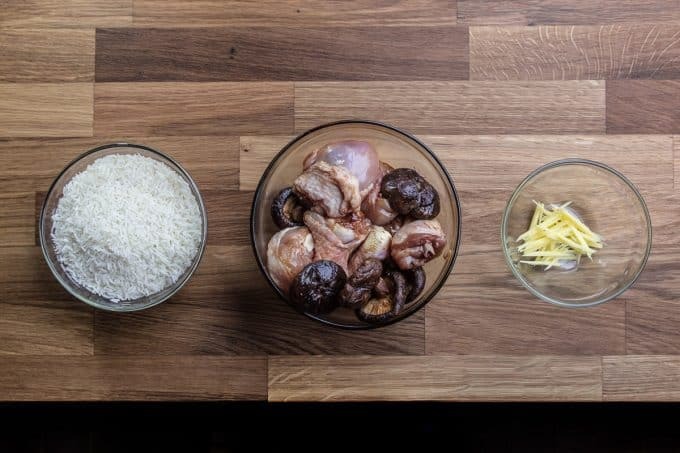 The first one pot rice we’ve experimented is a Cantonese classic – Shiitake Mushroom Chicken and Rice 北菇滑雞蒸飯. 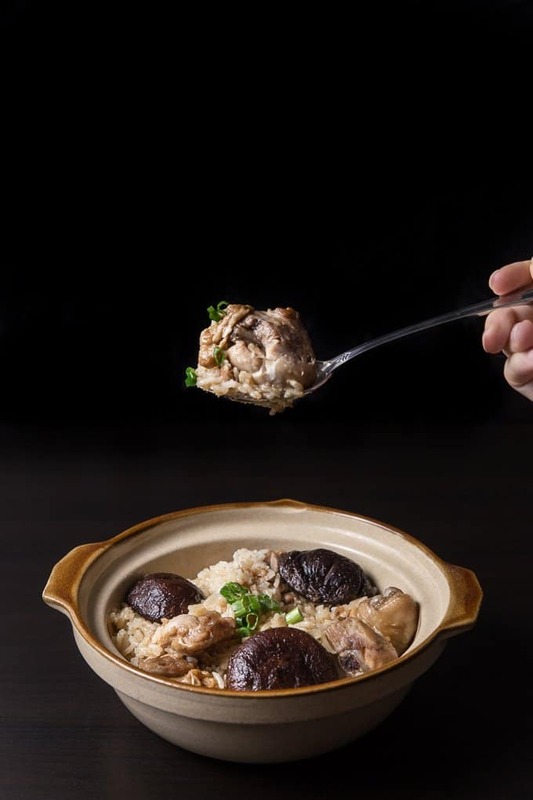 A bite of juicy mushroom with tender and moist chicken, paired with perfectly cooked fragrant rice full of chicken flavors. It’s so deliciously easy to eat. Easy, fast, and super convenient one pot meal. So awesome to make for the whole family on busy weeknights! Please carefully measure the amount of water you use!! This is very critical. Don’t wing it. If you have too much water, the rice will end up mushy; if you have too little water, it’ll end up dry and hard, or even burnt! Now it’s YOUR turn to take out your pressure cooker and cook some One Pot Chinese Pressure Cooker Chicken and Rice! Add the rice, 1 teaspoon of salt, and marinated chicken and mushrooms, and 1½ cup of water in the pressure cooker. Close the lid. Cook in high pressure for 9 minutes with an Electric Pressure Cooker, then, natural release for 15 minutes. Prep time does not include inactive time. Looking for more pressure cooker chicken and rice recipes? Me and my wife loves claypot chicken rice from Singapore hawker stores. I tried this once being careful to follow instruction, but I also got the ‘Burn’ message with rice sticking to the bottom. I think the newer machines are more sensitive or maybe they run hotter. However I tried this again using the pot-in-pot method (only water under) and it came out perfect. this recipe needs to be updated. We will update this recipe soon. I just made this in my IP 6qt and it wasn’t able to reach pressure because it started sticking to the bottom. The rice was partially cooked, chicken partially as well. To remedy this, I tried transferring it all to a steel bowl and placed it on a trivet with a couple cups of water in the pot. I knew if I added water to the rice in the pot, it would make it too mushy. I did 6mins and it worked out great. If it’s lacking flavor, I recommend fluffing the rice to mix around and distribute all the flavor – a small step that can make a difference! Just made this and it smells so good! I haven’t tried it yet, but I tasted the rice and it’s perfect! I used a pyrex measuring cup for the water and rice so that I had the exact measurement (the IP measuring cup isn’t an exact cup). I used brown rice and set the timer for 15 minutes, and then did a natural release for 5 minutes (as recommended in the comments). Afterwards, I had a lot of liquid leftover. It’s funny because many comments said they didn’t have enough liquid and got a burn message. I’m wondering if it’s because they used the IP measuring cup instead of an actual one. Anyways, I removed some of the liquid as there was oil in the liquid anyways and left the meal on “warm”. When I checked an hour later, majority of the liquid was soaked up by the rice! My question: Next time around, should I leave all the liquid and let the rice absorb it? Or should I remove some (like I did today). Also, am I suppose to have that much liquid? I’m not too sure how this dish is supposed to be? Thank you for a great recipe (as always)! The extra moisture probably came from the chicken being very juicy. I am planning to use bite size boneless thigh..Please tell me how long do I cook for? Chicken/mushroom on the bottom, then the rice, and Chinese sausages, is that the correct layering? Thanks. It will be roughly 3 – 4 minutes and 10 minutes natural release. After reading the comments, I changed a few things. 2-I deglazed the pan completely, until all the good stuff in the bottom was absorbed into the brothy liquid, and this was important not to get the burn notice. 3-I didn’t have shiitake mushrooms, so used dried that I had on hand, and used about 1 1/2 cups. 4-doubled the marinade due to the amount of mushrooms. 5-saved the water I soaked the mushrooms in, and used it in place of the water in the recipe. Also added 1 1/2 teaspoons Better Than Bullion chicken flavor to this water. 6-mixed rice in with everything else, and stirred it all around until it was completely mixed. Added about 5 carrots cut up into 1/2 inch chunks. I would have added peas, but nobody else in the family likes them but me. I am sure it changed the taste of the original recipe, but was still very good. This, for me, was a really good starting point. And I LOVE the dumping it all in part! Is there an updated recipe? Also, if there’s a specific way to layer foods into the pot (like I read in the comments afterwards that it would help to layer chicken and mushrooms into the pot then rice) can you add the instructions into your recipes? Although this is the first recipe I tried with my new IP and now a bit discouraged, I want you to know that I appreciate your work in putting these recipes together! I think I’ll try a soup next time, is that easier to accomplish? Sorry to hear what happened. It does seems like the newer Instant Pot is more sensitive with the burn message. We will try to publish an updated recipe soon. Just made it today and it turned out great, chicken and rice is perfectly cooked. 1 thing we found is that the dish isnt tasty enough, as in salty and flavourful, but we still loved it as its healthier and on the lighter side. I will definitely make it again but double the marinade quantities just for a more flavourful dish. Thanks for yet another awesome dish, onto the next time. does the water need to cover the chicken and mushrooms in the IP? im cooking 1/2 cup of jasmine rice and always cook that on its own with 1 cup of water, so if im throwing the rice and the chicken and mushrooms on top, should i go for 1:1 ratio or stick to what i am used to? Thank you for your question. The water should cover the rice. The chicken and mushroom should be partially submerged. 1:1 ratio will work out better as the chicken will release some juice as well. With the new Ninja Foodi, is it possible to get that scorched rice you are talking about at the beginning? What a interesting concept. Haven’t really tried airfrying rice like that so I am not sure. Do I put the rice in first and then layer the chicken on top? If I add chinese sausages and use boneless skinless pieces of chicken thigh instead , would the cook time be the same? Lastly, rice to water ratio is 1:1, right? It is best to layer the chicken at the bottom to avoid the burn error message from the Instant Pot. Boneless skinless chicken thighs will come out slightly drier, but the cooking time will be the same. If I use the pot in pot method for this recipe, will the cooking time and quantities be affected? I’m new to IP so apologies if this is a basic question! The cooking time will have to be increased by roughly 5 minutes. I tried the dish tonight and it was delicious – thank you for sharing 😀 The chicken was so succulent and so tasty! I did find though that some of the rice was not cooked, only a little bit though. Was I supposed to put the rice in the bottom of the pot? I put the chicken in first, then the rice. We recommend placing some of the chicken at the bottom to avoid the burn message. The rice should be fully submerged in the cooking liquid. I haven’t tried the recipe yet but wanted to ask if the cooking time is definitely correct. All the chicken instant put recipes I’ve done before with thighs or drumsticks need to be cooked for at least 15 minutes. I haven’t chopped up the chicken thighs with bones. Will this make a difference to the cooking time? For chicken thighs with bones, it will take 6 minutes and 10 minutes natural release. 2. the chicken is kind of bland. (Not salty enough) Is it supposed to be like that? 1) When using a natural release method, there will not be too much steam when releasing. 2) The chicken is not supposed to be like that. It could be the brand and type of soy sauce. The light soy sauce is regular soy sauce. Not low sodium ones. I love this recipe, it came out perfectly. Thank you so much for sharing! I added more five spices and serve with boiled egg (split half)…soooo yummy! If I were going to make 2 cups of jasmine rice, I use the rice cup that comes with my 6-quart IP, but I will have to use the Pyrex glass measuring cup to add 2 cups of cold water, right? Also if I want to add a couple Chinese sausages, I slice them and marinate with the chicken ..Then lie both chicken and Chinese sausages on the bottom of the pot before adding the rice and water, right? You will want to use the Pyrex glass measuring cup for both rice and water as it should be 1:1 ratio. You got this 🙂 layering them at the bottom of the pot is the best way. Not sure why but this is the 2nd time I tried this receipe and still failed. I followed the instructions for the rice and amount of water. But twice I got the burn message.😑. Sorry to hear what happened. Were you trying to double the recipe? Thanks for sharing! Quick question – if I use chicken thigh and cut them into pieces, do I still put the chicken and mushroom cook together with the rice? Will the chicken be over cooked? Yes, you can still cook the chicken and mushroom together with the rice. I follow the recipe but i got a burn notice. I tried to scrape off the burnt bottom and RE try but still same thing 😢Any tips to avoid this? I would recommend layering the chickens at the bottom as a single layer and then place the rice on top. We will release a newer version of this soon. Any adjustment to the cooking time if I want to make it without the rice? Sorry! Somehow missed your comment. The cooking time will be the same. I also always got the “overheat” problem the first 4 times I made this in my 6qt. Last night, altered recipe with 2 cups of rice and 2 cups of water instead of 1.5:1.5. Everything else the same. It finally turned out perfect!!!! Husband wants me to make it again. Could not be easier. Love! thank you so much for sharing your cooking experience with us and your kind words. I know you’ve replied to some comments about trying to “double this recipe”–have you had a chance to do that? If so, can you please share what/how to double or triple this recipe? Would love to have this at a potluck or to pack for multiple days’ lunches! Just tried to double the recipe–and it BOMBED 🙁 rice didn’t have as much flavor, chicken was more rubbery and overall, it tasted mediocre….nothing like the 1st time when it was a slam dunk. Thank you for all you guys do! We are going to re-develop this recipe to make it more fail-proof once things are settled! I just tried this recipe last night and my “burn” indicator went on also and my IP (Ultra) couldn’t get to pressure. I tried restarting a few times, adding water each time, and the burn indicator came on each time. After 4-5 times it appeared to have cooked everything enough, but I did have to add at least an extra cup of water throughout the process and there was a lot of burned rice at the bottom. The good news is that the end result was actually good; the rice was soggy but the flavor was delicious and it was very fragrant. I started with 1 1/2 measuring cups of rice and water (1-1 ratio, 8 oz per cup), with the rice and water in the bottom first and the chicken (around 10 thighs cut in half) and mushrooms (around 12 dried shiitakes) on top of the rice. The rice was therefore completely submerged and covered. I did at least double the marinade so that the chicken could be covered in a zipper bag and marinated for a few hours; I did not add any of the marinade to the IP though, just the chicken and mushrooms. This was about the 8th dish I’ve prepared in the IP so I’m still pretty new, but this is the first recipe I’ve tried that didn’t come out perfectly. I had assumed that the other reviewers might have had problems because they didn’t follow directions, but after my experience I respectfully suggest that there might be a problem with the recipe. Is there something I might have done wrong that made the burn indicator go on? I would appreciate any guidance you can give me. In spite of the problem, thank you for a delicious result! Thank you for your feedback and question for this recipe. We are going to re-develop this recipe really soon to make it more failproof as this is probably the most “problematic” recipe on our site. Can I use chicken breast for this recipe? What would the cook time be? Chicken breast will be fine. If you are chopping them up, it will only take 4 minutes + Natural release. Can this recipe be adapted for brown rice? Since brown rice will take longer, the chicken will overcook a bit if using brown rice. It will take 15 minutes and 5 minutes release. Just getting started – first recipe turned out beautifully! Congrats on your first meal!! Hi. I’m a brand new Instant Pot user and I’ve already made several of your recipes and up to now they’ve been wonderful!! For this chicken recipe, however, the “burn” indicator kept coming on before the pot could get up to pressure. After three tries of scraping the bottom of the pot and then adding more liquid I gave up and transferred everything to a stove top pressure cooker. I followed the recipe exactly and added the ingredients in the order that you described. Perhaps the water should go in first and the rice last? What would you suggest? Sorry to hear what happened. Amy and I are going to re-develop this recipe as a few of our readers have reported the same problem when trying to double the recipe. This is probably the only recipe on the website that is not fail-proof. Hi hi- I had to add a bit more of everything to marinade the chicken and mushrooms. I cut up the mushrooms, and I also added Chinese sausage and some liquid chicken stock sauce. Forgot the green onion garnish. Rice did turn too mushy, and brown on the bottom, but everything cooked perfectly. The mushy rice could be the result of the chicken pieces having too much moisture in them. Take care & have a great week~! How do you chop the drumstick? A heavy cleaver will be one of the best tools to chop drumsticks. If I try this with boneless chicken thighs, should I cut the chicken into small pieces? Would this work with chicken tenderloin? Should I cut those into small pieces or leave whole? Thanks! Chicken thighs will work better than chicken tenderloin as tenderloin will become rubbery if overcooked. You can leave the chicken thighs as a whole or cut them. Cutting them will allow the marinade to penetrate better. Thanks so much for sharing this. This is one of my fav dishes. Is it possible to cook it with frozen chicken? It will only work with frozen chicken cubes. In theory, frozen drumsticks or thighs will not fully cook in this recipe. Hi Amy and Jacky!! I’m a huge fan of your website and especially this recipe, which I love and am making for dinner tonight. It’s really magical how the chicken AND the rice both cook PERFECTLY. Can I submit a request? I’ve been wondering if you could make hand pilaf (I think in Chinese it’s 羊肉抓饭?) in the IP. It looks sooo delicious and it’d be so convenient in the IP! Do you think this would work? Thanks! I have added hand pilaf to our long to-make list! If I want to add veggies (gai lan or bok choy), do I add them in the beginning with the rice and chicken? I would recommend cooking the gai lan and bok choy on stovetop as the pressure cooker will overcook them too much. I’ve tried this recipe shortly after getting the IP and the flavour turned out great but the rice was a bit mushy and I’m confused about the rice measurement! To confirm, when you say “1½ cup (345 g) Jasmine rice” do I measure 1-1/2 of the IP-provided rice cup? Thanks! For this recipe, it is 1 1/2 cup glass measuring cup. We have started changing all our rice measurements to glass measuring cup to avoid confusions. Ohhhh – soooo very good. Perfect comfort food. Great recipe! I followed your instructions exactly with 7 drumsticks in a Instant pot and it turned out tasty. Only a little bit of the rice browned at the bottom of the pot. The only thing I would point out for others is that the prep took 40+ min between soaking the dried mushrooms for 20 min and then marinating them with the chicken for another 20 min. Thanks! Thanks for a great recipe. Made this yesterday for my son’s birthday party and everybody liked it. Question: if I am to double the recipe (double all ingredients including double the rice, chicken, and water), do I need to increase cooking time? By how many minutes for double recipe, triple recipe? Some readers have reported problems when doubling the recipe. We haven’t had the time to test it yet. However I did further reading in the comments… your recipe called for 2 cups rice and 1.5cups of water ratio. I’m using the rice cup that comes with the DUO80 and I read your reply to Keith on July 24th that water:rice ratio 1:1 so 1.5cup rice:1.5cup water. Could it be a typing error in the recipe – 2cups rice: 1.5cup water? Sorry to hear that. It sounds like the Instant Pot didn’t have enough water to get up to pressure. It is 1:1 water and rice ratio. The rice cup is only 180ml. You will have to use a standard glass measuring cup for the water. I have updated the recipe to make it less confusing. Sounds like it didn’t have enough water. I will have to do some testing with this recipe for DUO80. Hi Amy & Jacky, were you able to double the quantity and got it to work? I haven’t cooked this before but needed to cook a double serve to feed my family. Please let me know. just made this tonight. so delicious. i was thinking about substituting the jasmine rice with brown rice. how much longer do you think I should cook in order for the brown rice to cook fully? Brown rice will take roughly 15 minutes depending on your preference. You can follow this brown rice recipe here. This looks delicious! Can it also be made with brown rice for a healthier option? Brown rice takes 15 minutes to cook so the chicken will overcook quite a bit (I would suggest not cutting up the chicken drumsticks to prevent it from overcooking too much). Can this recipe be made without rice? How would you adapt the recipe to cook without rice? Thank you so much for the feedback Samantha!! The mushroom stock and lap cheong add great flavor for sure :)!! This is the first dish I tried in my IPot and so inexperience may be a problem. I used chicken thighs cut in half, measured the rice using the “cup” from my rice cooker, and 1 1/2 real cups of water. I marinated the chicken in the pot. I mixed the rice and mushrooms into the chicken so that I had a uniform layer. When I opened the top, I had a mound of rice in the middle, and the top of the mound of rice was not cooked. Any ideas what I did wrong. I added another cup of water, stirred everything up and put it on for 4 more minutes. Dinner was great, but would like to know what went wrong. Not sure if this is the problem, but rice needs to be fully submerged in the liquid to cook correctly. So if the rice in the middle and at the top was not submerged in liquid, they will not cook correctly. First of all, THANK YOU for this recipe. It’s tastes exactly like one that my mom used to make. Perfect comfort food for me. Just wondering if you could help me troubleshoot where I went wrong? Should I add more water next time? I’m desperate to perfect this recipe as it will definitely be family favourite. The water and rice ratio may have been off. Yes, more water is needed if it is not getting up to pressure. This looks delicious and I can’t wait to make it! Do you have recommendations for making this gluten free? I know I can substitute Tamari for Soy Sauce, but with the requirement of both light and dark soy sauce, and additionally with the Rice Wine you recommend containing gluten, I would love to hear your recommendations on ingredient substitutions. As for rice wine, you can use sherry wine as a substitution. I made a similar recipe from a different website and was not pleased with the results. So when I saw this on your site I was so happy to try it again. I just made this tonight and it came out super delicious! I ended up making double the marinade, and using the second amount as part of the liquid for the rice (I put it in the measuring cup then added water until it was enough). I also added some honey since I didn’t have dark soy sauce. This recipe was so easy, I’ll definitely be making it again and again. Thanks for another winner recipe! I tried this recipe yesterday. I followed the direction with the pressure cooker exactly – 9 min manually in high pressure and 15 min natural release. I was so excited to open the lid but when I did, the chicken and rice weren’t cooked! What am I doing wrong?? Please help!! FYI, I did it again but this time I pressed the rice button. The chicken was cooked but some rice was not cooked. Please make sure the venting knob is turned to sealing position and the sealing ring is properly seated. 1. Following the same instructions as above and use 10 chicken thighs. The top chickens were raw in the middle. 2. Making it with 3 rice cups and 10 chicken drumsticks. The rice one the outter edge and the chicken on top were raw. I noticed that other people have had the same issue. Does anyone know why? I really want to make this recipe when I have guests over but I don’t want to have to make two different pots. Thanks. hopefully Amy and I will be able to test this recipe by doubling it to see what happens this month. I tried this with 4 chicken thighs (1.5 lbs. ), cut into quarters with the bone on one of the quarters. I marinated for 2 hours and put the thighs in a layer on the bottom with the skin side down, then the mushrooms, then Gen-Ji-Mai brown rice instead of the jasmine, and finally the 1.5 cups water, making sure to moisten all the rice. I sealed up the Instant Pot and ran it for 11 minutes at high pressure on manual. The rice was thoroughly cooked, but very slightly on the moist side, almost like a chewy short grain rice. The excess fat settled to the bottom of the pan and kept things from sticking. Hello! I notice that ginger is listed both as a main ingredient as well as a part of the marinade, but I didn’t see any instructions for what to do with the ginger that ISN’T in the marinade. Did I miss anything? Good eyes! Sorry, the ginger in the main ingredients list is for garnishing. It was an error on our part. Thank you. I am very surprised it went unnoticed for such a long time! Love all your recipes. Instead of Jasmine rice, can I use short grain rice and will it be same water to rice ratio and same time? How much water do I put in if I use brown rice? Using brown rice will overcook the chicken too much. I used 2 cups rice and filled the instant pot up to the 2 line mark, and the rice was scorched on the bottom. I didn’t cut up the chicken legs but allowed them to marinate an hour. I also squirted about a Tbsp of hoisin sauce to the marinade , and sliced up the shiitake mushrooms after they soaked in hot water, then threw them in with the chicken + marinade. It was tasty and kid-approved. We have heard a few readers report on the rice getting scorched on the bottom when doubling the recipe. We will have to try doubling it to see what happen! Stupid question: do you put the marinade in with everything else too? Or just the marinated chicken? You can marinate the chicken and the shiitake mushrooms if you like. for this recipe, can I use basmati rice instead? Yes, basmati rice will work! Can I use 4-5 chicken thigh with bone, instead of drumstick? Also what is a good substitute for dark soy sauce; can I use just regular Tamara doe both light and dark soy sauce? Thank you! Yes you can use 4 – 5 chicken thighs instead of the drumsticks. It will come out tasting slightly different, but Tamari will be a good substitution as light & dark soy sauce. Dark soy sauce brings sweetness, so You may want to sweeten the sauce a little with a bit of sugar. ¹. I find that the chicken tastes better if I left it marinate longer. I’ve done it for 3 hours and it’d great. I am too lazy to chop up chicken so I use 2 packs of the party wings that I get at Costco and I find portion is about the same. Recipe is great. 2. I can’t double this recipe. As someone described, some rice was cooked. Some was under cooked and chicken was under cooked. I had already increased cooking time to 13 min. We will definitely need to double this recipe and see what happens! I just discovered your blog while googling Chinese chicken and rice recipes. This looks yummy and I’m definitely going to try it! Could you please please post a recipe for Loh Mai Fun? If anyone can make this dim sum dish in a pressure cooker, it would be you! Thanks!! Thank you for your comment and we are so glad you found us! Like Sarah I plan to use jasmine brown rice. I am wondering if if I should just follow directions and add more water like she said. However, brown rice cooks a bit longer than white, so what adjustment to cooking time would you suggest? Or should I pressure cook rice a bit first, for like 5 min, quick release, add the rest of the ingredients, then follow pressure cook time as per directions? You may have to increase the cooking time by 2 minutes. Pressure cooking the rice first will not work as the rice would have absorb most of the water and prevent the pressure cooker from getting back up to pressure the second time. Hi Amy and Jacky, just picked up the IP for black Friday and did your congee recipe with turkey jook, of course I doubled it and it came out fantastic! Thanks for posting these great recipes. Doing this recipe but with doubled the rice and water. Added some lap cheurng and lap Mei, and conpoy, and fresh shiitakes and bell pepper for kicks. Cooking the same setting at 9 min and 15 min natural release… its cooking now so Crossing my fingers! I would like to your thoughts on: after I cook the rice/chicken in the IP, put them in a clay pot, and cook it some more on the stovetop (to form that layer of scorched rice). Maybe reduce the cooking time in the IP by a tad, so I won’t overcook the chicken? Do you think it may have a similar result as the restaurant kinds? I would try this for restaurant result. I would heat the clay pot on medium high heat with about 1 – 1.5 tablespoon of peanut oil. Wait until it is well heated before browning some of the cooked rice to form a “burnt” layer at the bottom. You will probably have to turn the heat down a little to avoid the rice to burn too much. Please let me know the result! The recipe seems to produce way too little liquid to cover all the chicken and mushrooms: Only one spoon of soy sauce, and a tbsp of wine? nothing else? I didn’t use dried mushrooms, so maybe that was my problem. Did you use the water the mushrooms soaked in for the marinade as well? For this recipe, the marinade is more paste-like and doesn’t have to cover the chicken pieces. It is more as a surface treatment. The chicken pieces are cut up to allow more surface for the marinade to stick to. Wonderful recipes you guys have posted. I am just wondering for this recipe if it’s OK to substitute just star anise for the five spice powder? Would that alter the taste a lot? Hi, what is the rice/water ratio if brown rice is used? and would the cooking time change as well? Since brown rice takes at least 15 minutes pressure cooking time, it is better to cook with the chicken separately to avoid overcooking. I doubled it and increased time to 15 but did not work out. Some rice over cooked, some rice under cooked, chicken not fully cooked. It sounds like the pressure cooker was not sealed properly to get a result like that. The silicone ring may not be seated properly. Doubling this recipe does not require the cooking time to increase. Hi there! Thanks for the recipe! It didn’t work out that well for me in my IP and I’m wondering if it’s because I didn’t have enough water due to the rice absorbing most of it (I followed your directions exactly). My IP never pressurized so when it went through the cooking process & the 15 min natural release, my chicken didn’t cook at all. Wondering if you placed the chicken & mushrooms directly on top of the rice in the IP? Would love to hear your thoughts! Cheers. 1 1/2 cup of water (375ml) is plenty for 360g Jasmine rice. 1) The Instant Pot may not be sealed properly. The silicone ring may not be seated properly. The venting knob might be in the venting position instead of the sealing position. 2) Did you start the pressure cooking cycle immediately after adding 1 1/2 cup of water into the pressure cooker? Rice would have absorbed too much water to prevent the pressure cooker to go up to pressure if it was sitting there for a few minutes. Hi. How to adjust cooking time if I halve the recipe? I cook for only 2. We’re not big eaters and prefer not to have leftovers. Can the IP do 1 cup of rice for this recipe? Thanks for your wonderful recipes. I’m a newbie to IP cooking and have learnt a lot form your site. Just made this for dinner! Tastes pretty good, but I would probably reduce the 5 spice powder to 1/2 tsp next time. Thanks for sharing the recipe! Thanks so much for trying our Pressure Cooker Chicken and Rice Recipe. Hi Sheena, thank you for your question. It should also work with a stove top pressure cooker. You have so many great recipes I don’t know which one to start with. Thanks so much for posting them. Question: when your recipe calls for 2 rice measuring cups I’m assuming the measuring cup that comes with the IP? When I measure 2 liquid cups with the IP it comes to 300ml. And being an American we don’t use metric. So I’m trying to understand the measurements so that I get the right conversion ratios since I know the liquid to rice amounts are very important. Just make sure the water and rice ratio is 1:1. For this one pot chicken rice recipe, we ask for 1 1/2 cup of water and 1 1/2 cup of rice. The rice was probably cooked immediately and hence it was burnt. I remade this recipe as described, and its perfect. So, probably as you said, the rice cooked too fast and didnt generate steam. JC, thank you for letting us know ? I will try to double it to see what happens next time we make this one pot chicken rice!! Just an update on doubling the quantity….dont do it. I was not able to double to amount even tho it should be possible. But the rice was too heavy and sit at the bottom of the pot. With the heavy, no steam was generated did not come to pressure. Had to salvage this on the stove top and turned into a thick congee. We haven’t tried doubling the quantity, but in theory it should have worked. May I ask if the rice were cooked immediately after you have mixed in the water? If it was not cooked immediately, the rice would have absorbed too much of the water to generate enough steam for the pressure cooker. Awesome recipe. Followed the marinade and did a few substitutions. Used chestnut instead of mushroom. Turned out great, and there is not enough left overs. I will definitely it next time. Can this be done with fresh shiitakes and chicken off the bone (like boneless chicken thighs)? Looks great. Dried shiitake mushroom has a higher concentration in flavor than fresh shiitake mushroom. If you are substituting with fresh shiitake, you will have to use more to get that flavor profile. I haven’t tried this dish with fresh shiitake, but I would try using double the amount. I loved this! Can you double the recipe? Would I just double everything and keep the cooking times the same? Hi Ruby, you got it! You can double everything and keep the same cooking times.